Police have uncovered a 670m (2,200ft) drug smugglers' tunnel under the US-Mexico border - the second such discovery this month. The tunnel links the Mexican city of Tijuana with Otay Mesa in California. Earlier this month a tunnel equipped with ventilation and lights was found. Local media say the new tunnel may be even be more sophisticated. 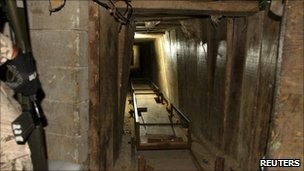 The authorities say the tunnels are used to smuggle marijuana into the US, bypassing stringent border controls. Investigators with the San Diego Tunnel Task Force said the latest tunnel led from a house in Tijuana to a warehouse in Otay Mesa, California. Several suspects were arrested both in Mexico and the US as part of the operation.